Amy MacDonald can attest that the lessons she learned from longtime trainer Mary Henry had as much to do with setting her up for success as a manager of public health in the Nova Scotia Health Authority as they did with riding. But perhaps the “Mrs. Henry lesson” that MacDonald holds closest to her heart is the one about developing a strong team. MacDonald, 38, has been around horses her whole life. Her father, Douglas MacDonald, enjoyed showing Percherons; she and her elder sister Carrie MacDonald were active in the Avon Pony Club (Canada) and rode anything their father could find, from unruly green ponies to more experienced show mounts. Carrie remains an avid horse show volunteer and mom. 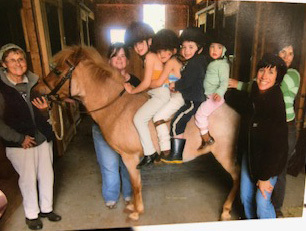 Amy started riding with Henry when she first swung a leg over her leadline pony at 6, and the 81-year-old instructor continues to coach Amy today, more than 30 years later. Henry moved to Nova Scotia from England in the late 1960s to work at an all-girls boarding school, and she started the local Pony Club. 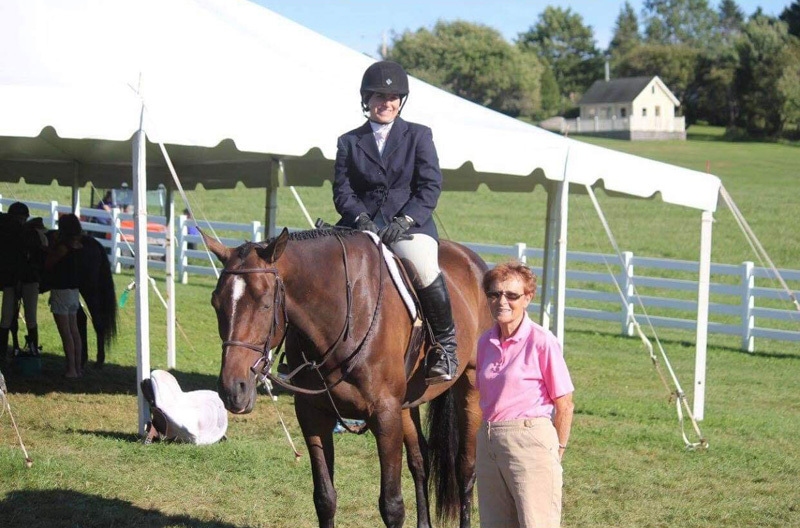 She continues to coach juniors and coordinate lectures for the Pony Club, and Amy is her only adult student. Amy MacDonald started riding with Mary Henry when she was 6. Amy has used that foundation through plenty of ups and downs with her 14-year-old Dutch Warmblood gelding O’Alfie. “Alfie’s” early career was derailed due to a serious leg injury, and he spent two months recovering at the Atlantic Veterinary College on Prince Edward Island. Once home, he spent six months in an immobilization bandage and an additional six months on stall rest. It’s really only within the past two years that Alfie has found his stride in the show ring. “I think he’s finally matured,” says Amy. Amy keeps Alfie at her father’s farm in Newport. She and her non-horsey husband Shawn Rovers live across the street and do the morning barn chores together. Amy admits it can be challenging finding the time to ride five or six days per week, and she’s grateful her niece and her husband help make all of the pieces fit together. 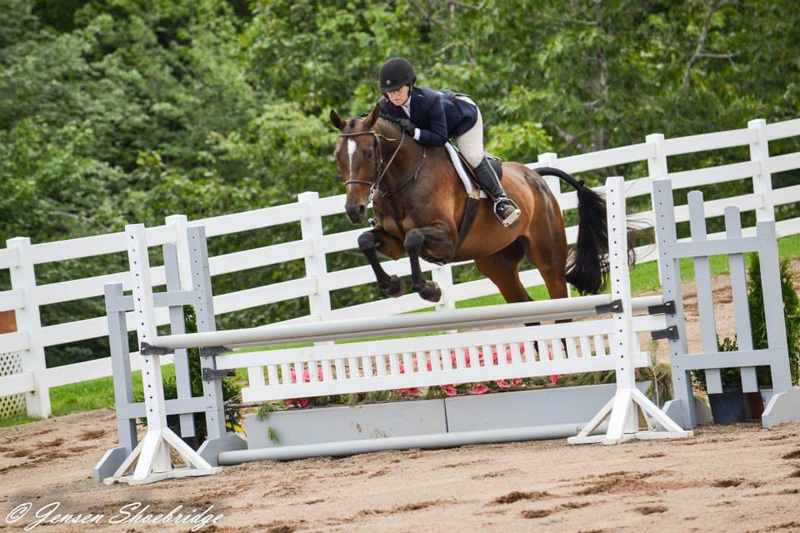 Amy competes in the 3′ adult amateur and occasionally an open division at 3’6.” Often she’s the only amateur riding at the 3’6″ level, but she wants to keep her skills tuned up at that level. This year, Amy is sharing Alfie with her 14-year-old niece Brianna Partridge, who’s transitioning out of the pony ring.